no septic job to big or small - We can handle any septic installation. 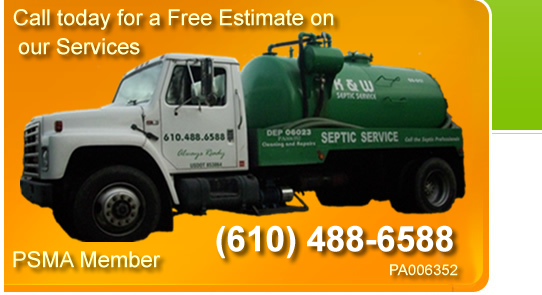 K and W Septic A Full Septic Service Company Berks County Pa.
We offer professional service with competitive prices. Handling all aspects of you residential or commercial septic system, from full installations, of any system, to septic system repair and maintenance. Servicing Berks County Pa. Residential and Commercial Septic Tank Cleaning - Quality Septic Tank cleaning and repair. K and W also cleans and Maintains cesspools, and Performs tank and baffle inspections during your septic tank cleaning. We will take the time to explain the process, and educate you on future problems you may incur during the life of your Septic System. We Service all towns in the Surrounding Berks County Area. from Boyertown Pa, Reading Pa, to Centerport Pa, Shartlesville, and Cleaning septic systems in many more towns in Berks County Pa.
We offer septic system replacements and repair, tank replacements, pump station inspections, all septic repairs, probes, tank location, small backhoe services, sound mound installations and service, and much much more. Many towns in Berks County are mandating septic pumping even for rural Berks County residents. K and W septic can keep your home on schedule by cleaning your system, and inspecting your system to keep your septic system running trouble free for years to come. Please contact us to get your home on our regular scheduled septic pumping reminder list to take the worry out of meeting current municipal regulations.